Juniper Russo, an eclectic autodidact, has been writing professionally since 2008. Her work has appeared in several online and print-based publications, including Animal Wellness. Russo regularly publishes health-related content and advocates an evidence-based, naturopathic approach to health care. Most toddlers experience occasional, mild breathing problems. In most cases, breathing difficulties in toddlers are caused by a viral infection, such as a cold or viral bronchitis. Several home remedies can treat these problems with few side effects or risks. If your child has persistent breathing problems that last for more than seven days, consult his physician. An evaluation can determine the presence of another condition, such as asthma, pneumonia or seasonal allergies. In addition, renowned pediatrician Dr. William Sears urges parents to seek prompt medical care when a child shows persistent "red-flag" symptoms, such as labored breathing, wheezing or a caved-in chest. Give your toddler extra fluids, including water and juice, to loosen mucus and prevent infection-related dehydration. According to MayoClinic.com, fluids will not defeat a virus, but they can minimize discomfort and prevent common complications. Use a cool-mist humidifier in your toddler's room. The American Academy of Pediatrics states that humidifiers can moisten the air and make a sick child more comfortable. Humididiers may also be useful to children with non-infectious respiratory illnesses, such as seasonal allergies. Give your toddler 1/2 tsp. of honey to relieve coughs and chest congestion. Although the American Academy of Pediatrics recommends this popular home remedy for children older than 1 year of age, the organization warns against its use in babies. According to the parenting information website BabyCenter, honey contains trace amounts of bacteria that may be harmful to infants younger than 12 months of age. Use at-home physical therapy to loosen phlegm from your toddler's chest. The AAP instructs parents to lay the child face-down and tap his back with a cupped hand. This simple technique enables the toddler to dislodge and expel thick mucus in the lungs and trachea. 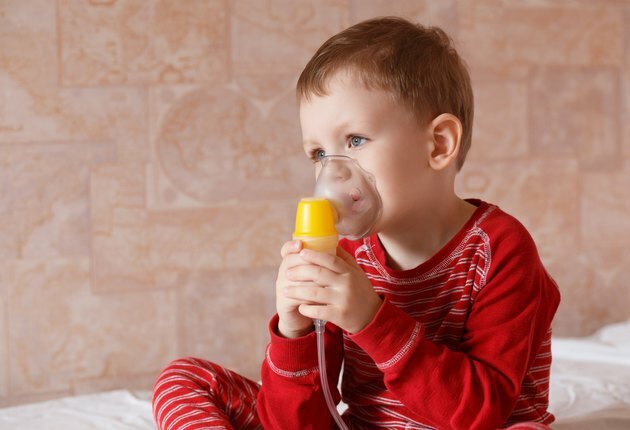 Call your toddler's pediatrician if you are interested in using a prescription or over-the-counter product, including an herbal supplement, to treat your toddler's respiratory ailments. A licensed health care provider can explain the possible benefits and risks of using these products. Do not give nonprescription cold medicine to a toddler who is younger than 2 years old. The AAP warns that these products can cause life-threatening reactions in young children. MayoClinic.com: When Can My Baby Eat Honey? What is the Best Way for a Child to Sleep When Coughing?